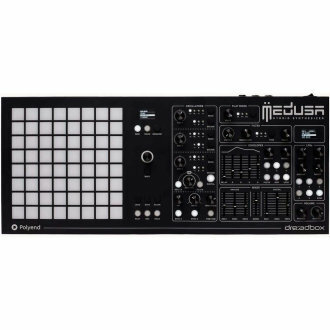 The Medusa hybrid synthesizer is a fruit of the collaboration between Dreadbox and Polyend companies. It has emerged from both teams' unusual approach to integrating analog and digital domains into a totally new quality. The innovative way of connecting a classic synthesis character with the digital versatility and unique musical controller brings out the best of these two worlds. Seems like a simple addition, but this fusion brings something that has never been available before. - 64 fully responsive and customizable, three-dimension expressive pads. - The Grid is storing 256 independent sequences and voice presets. - Choose any modulation parameter per pad for X and Y pressure axis. - Three sequencing modes: step, live and incremental. - Both a musical controller and sequencer fixed in one powerful Grid. - Sequence notes, parameter locks or even entire synth voice presets per step. - Advanced voice and sequence randomizer onboard. - All necessary Grid information is given on a crispy OLED display. - Three synchronizable analog oscillators with the choice of four classic wave types for each of - them. - One 24dB classic Dreadbox analog filter with three different types (2pole LP, 4pole LP, HP). - FM frequency modulation separately for oscillators and filter. - Noise generator with colour shaping.Three wavetable digital oscillators. - Three different play modes: monophonic, paraphonic x3, paraphonic x6. - Audio input lets you use the power of Medusa with external audio sources. - Second OLED screen to display all necessary synthesis data. - Five independent and adjustable low-frequency oscillators with an extensive pool of parameters to control. - Five independent, adjustable and loopable DADSR envelopes with a wide list of parameters to assign. - Mixer for all seven paths of independent analog, digital and noise voices. - Separate volume control for headphone and main audio outputs. Implemented MIDI protocol with bi-directional USB and DIN input, output and through. - All that analog and digital functionality connected in one clearly marked layout sealed in a sturdy tabletop aluminum chassis. - Handily placed aluminum covered knobs, informative LED buttons for the comfort of use. The Grid pads made of specially designed silicone, so their immaculately matched density and firmness are providing an instant and precise response. Same Day Music is an authorized dealer of Dreadbox products. Available until 11 PM (EST) today. Mention special code 1ZM-CV9J when you call.